Arunachal Pradesh Youth Congress leaders addresses Press Conference in Itanagar on December 6. Arunachal Pradesh Youth Congress (APYC) on Thursday demanded the resignation of Panchayati Raj minister Alo Libang by December 20 for his alleged failure to conduct the rural polls in the State. 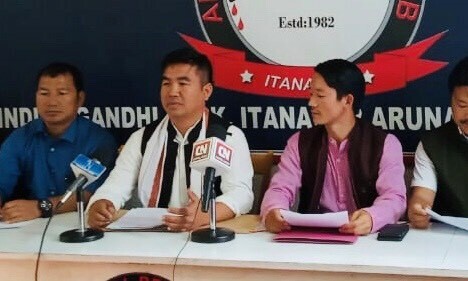 Addressing a news conference at the Press Club here, Youth Congress president Geli Ete said that the BJP-led state government was defying the order issued by the Gauhati High Court to conduct the panchayat elections in Arunachal by December this year. “This is contempt of court and it clearly shows that minister is incompetent. By not conducting the election, he (Libang) is also curtailing the rights of the citizens,” said Ete while adding that State government, instead of holding the rural polls has filed an interlocutory application at the High Court. “The government has sought another six months to conduct the elections while stating that it is facing financial crisis,” Ete disclosed. The Gauhati High Court had in July this year directed the Arunachal Pradesh government to conduct the rural polls in State by December. The term of the three-tier Panchayat bodies expired on May 31. Accordingly, Minister Libang had in August assured that government was working on the modalities to conduct the elections in December. A change in the structure from the three-tier Panchayati Raj system to a two-tier was the reason given by the minister for delay in conducting the polls. The APYC on the day also demanded the resignation of deputy chief minister Chowna Mein for his alleged failure to resolve the Trans-Arunachal Highway (TAH) crisis and that of all the board members of Arunachal Pradesh Public Service Commission (APPSC) for their failure to conduct the civil service examinations properly in State. “The TAH scam is one of the greatest rip-offs of the State which happened under the nose of Mein who is also the minister of PWD, finance and planning. He should be held sole responsible for the mess and delay in completion of the project,” Ete said. The 1559-km-long TAH also called NH-13which extends from Tawang in the west to Kanubari in the east is one of the most strategic roads for Arunachal, both in terms of national security and developing the rural areas. The Youth Congress has threatened to launch a statewide democratic movement titled ‘Arunachal Bachao Movement’ if its demands are not met by December 20.